This is a light oil that is excellent for most massage techniques. With its natural concentration of Vitamins A, B1, B2, B6 and E, it is great for skin because it naturally combats dry, itch skin and inflammation. 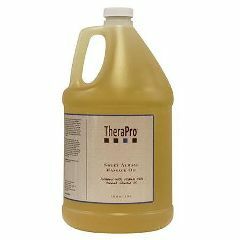 Add TheraPro essential oils for the benefits of aromatherapy with every massage. Available in 8 oz., 1/2 gal., and 1 gal. containers. Under normal room conditions shelf life is estimated at 18 months.